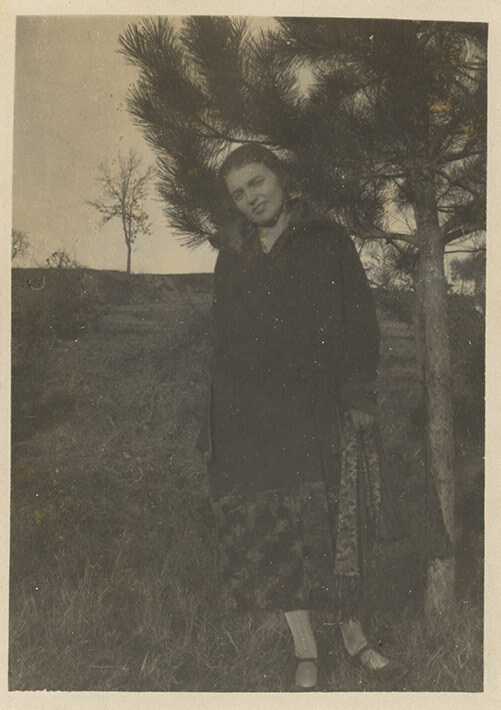 This is a black and white snapshot of Luisa Guagneli standing by a tree, taken on December 29, 1922. This picture was taken before she was married to Arturo Guagneli in 1925. On the back of the photo, she writes, "Ad Arturo, in attesa di una migliore conoscenza!" (translation: To Arturo, In the hopes of getting to know you better!" Luisa is wearing a black knee-length jacket with a lined hood over a patterned mid-calf length dress (or skirt), white stockings, and black Mary Jane shoes. She is also holding a printed scarf in her left hand. She is smiling at the camera and leaning slightly towards her right. A pine tree is beside her and there are other trees and bushes in the background. It appears as though she is in a field or a country side setting.